Production vs. production capacity. Stephen Covey coined this wonderful concept that applied to our ability to build a personal brand in his superlative work, The Seven Habits of Highly Effective People. Production refers to a person's level of direct work output on a day-to-day basis while production capacity refers to one's ability to produce. If you're looking to build a personal brand, it's important to consider efforts to further both paths to a more effective personal brand. Production is the easier of the two ways to understand. How many reports did you produce? How many campaigns did you successfully execute? Did you check all the boxes to receive a positive grade in your occupation, classroom, or other evaluated effort? We can directly measure production. As a result, we tend to focus solely on it as a way to advance in our careers and build our personal brands. Production capacity is a much fuzzier concept and can therefor be neglected. It's a shame, really, because investing in production capacity allows us to reach entirely new levels in our ability to produce in the first place. How many more reports could you produce this month because you took the time to learn a VLOOKUP in Excel instead of copying/pasting spreadsheet values manually? How has the ROI of your campaigns improved over time? How well do you understand the principles of what you do regardless of a letter grade or evaluation cohort? We rarely ask ourselves these questions, but think about what would happen if we did. As you build a personal brand, consider combining the multiplication of your daily efforts with the calculus of your ability to continually improve to create a better way to work towards achieving your maximum potential. And if you haven't ready the 7 Habits, I highly recommend it. What do you do to improve your capacity to produce and how has that increased your levels of production? 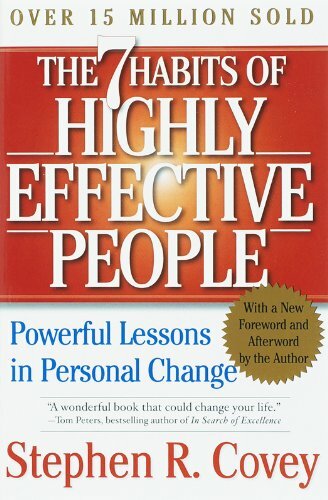 Have you read the 7 Habits of Highly Effective People ? Where do you think people go awry when building a personal brand? You're invited to share your thoughts in the comments.